I enjoyed this very much, but I think I hold Carey to higher standards, so it didn’t wow me completely. 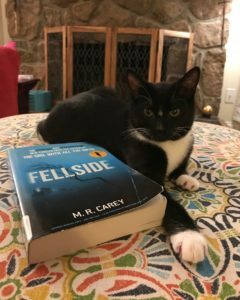 The Girl With All the Gifts was tremendous, and The Boy on the Bridge was great, and I looooove Felix Castor, so while Fellside was very good as a book on its own, it wasn’t quite what I was hoping for from a Mike Carey Book. Jess Moulson is a heroin addict with a crummy boyfriend. While in a drugged stupor one night, their apartment catches fire. Jess and the boyfriend are burned but survive, but the neighbor boy upstairs dies tragically of smoke inhalation. Jess ends up in Fellside prison because of Alex’s death, drowning in guilt and misery. She resolves to commit suicide by hunger strike, convinced she can be of no use to the world. Weakened by her ordeal and hunger, the barriers between the worlds grow fluid, and Jess starts to receive visits from a ghostly Alex. He gives her hope that she didn’t kill him, and enough clues to figure out who did that she changes her mind, deciding to live and help Alex find out the truth. Naturally, it’s not the easy. The prison is full of corrupt staff and psychotic inmates, and Jess’s path through real life is almost as dangerous and confusing as it is in the dream/ghost world. Her guilt and grief about Alex keep her on her path, and she begins to learn more about who she is when she’s not an addict and an abused girlfriend. As always with Carey, the writing crackles and the characters spring off the page. Jess was incredibly damaged and difficult but still root-for-able, and the multitudinous villains help build a tense atmosphere, claustrophobic even for a prison. It was tough to imagine how things were going to work out, and the ending didn’t go where I thought it would. Original and interesting, with Carey’s great knack of tying all the loose threads together, even if they don’t end up neatly. Share the post "Out-of-body experiences would come in handy in a prison"